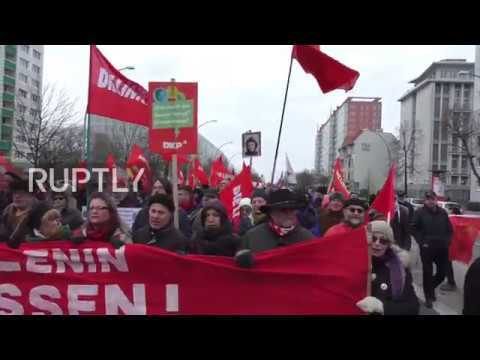 Thousands of socialist supporters remembered Rosa Luxemburg and Karl Liebknecht in Berlin on Sunday as they held their annual rally in honour of the communist figures. Supporters marched from Frankfurter Tor through Berlin’s streets holding flags of the remembered Marxist philosophers before eventually laying flowers in their honour at Gedenkstatte der Sozialisten in Friedrichsfelde. One attending, Marsel, said: "it's pretty important not to forget the people who fought for Socialism". "The future, we have the rising right [wing politics] movement all over Europe - all over the world basically. [US President] Donald Trump and European nationalists and AfD in Germany, and I think we should remember the past in all its different shapes," he added. Luxembourg and Liebknecht were both shot dead on January 5, 1919 by German Freikorps soldiers in Berlin. Since the creation of the German Democratic Republic, socialist and communist sympathisers have held an annual memorial march in honour of communist and socialist figures on the second Sunday of January each year.